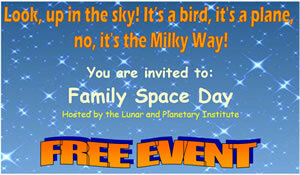 with the JSC Astronomical Society on Saturday, January 20, 2007 at 7:00 p.m.
As a part of the Institute’s monthly Family Space Day events, families with children ages 5 to 8 are invited to the LPI to view a host of astronomical sights including planets, constellations, nebulae and galaxies, and to participate in hands-on science activities. Several telescopes will be available so everyone will have an opportunity to view. If you own a telescope, bring it with you! or contact Katy at 281-486-2106. Please come by and take a tour of the night sky. A responsible adult must accompany their children at all times.